After half a decade with John Sweeney at the helm of the AFL-CIO, whose executive council held its winter meeting here in mid-February, there's a sense in the top ranks of the union movement of both accomplishment and inadequacy, progress and stagnation, potential power and continued vulnerability. There is a widespread feeling that the "revolution" of 1995--when Sweeney's slate won the first contested battle for leadership of the labor movement in a century--has mainly pointed in the right direction, but that reform must be dramatically intensified and infused throughout the ranks of union members if the labor movement is going to survive, let alone flourish. The good news is that organized labor as a social institution, and its "working families agenda" for American society, has broad and growing support from the public. 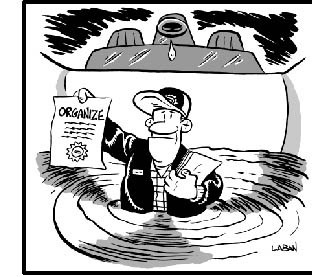 A new Peter D. Hart Research Associates poll for the AFL-CIO, for example, found that 41 percent of the public views unions positively, and only 24 percent holds negative views--compared to a 35 percent to 34 percent margin of positive-versus-negative views in 1993. The greatest improvement in views about unions was among blacks and young people aged 18 to 29. And now 42 percent of nonunion, nonmanagerial workers say they would vote for a union, a jump of more than one-third since 1984.
members' households to go to the polls and vote for candidates that unions supported, mostly Democrats. In elections, as well as organizing and legislative fights, unions are realizing the power of mobilizing their members to educate and motivate co-workers and community allies. The bad news is that despite extraordinary efforts by unions, George W. Bush is president, and Congress and the White House are both controlled by Republicans for the first time since 1954. The outcome may have been different if the votes had been fairly counted, but, in the end, labor bet the farm on the Democrats and is now landless. Union leaders worry that labor will be under siege, facing dozens of defensive battles in Congress against efforts to cripple union political operations, reverse crucial workplace safety regulations, and nibble away at workers rights and union power through investigations, legislation and executive orders. Labor's problems are not just political, however. If a recession or even a mild slowdown develops, many workers will lose their jobs, and union analysts project that unions will disproportionately and permanently lose more members in a downturn than they will gain during a recovery. Also, after several years of gains in organizing that had stopped unions' decline in their share of the work force, membership numbers dropped again last year. Even the unions that had been leaders in organizing before 1995 still have a long way to go in transforming themselves, and a majority of unions have, at best, just started to develop an organizing strategy. Despite these grim prospects, organized labor is better prepared to resist attacks and continue to press for at least some of its agenda than it was in the Reagan era, when Democrats still controlled the House. Politically, union strategists plan to continue to press for prescription drug coverage under Medicare, a strong patients bill of rights, a higher minimum wage, campaign finance and election procedure reform, and immigrant rights, including a broad amnesty for current immigrants without proper papers. For starters, labor will be fighting the Bush tax cuts as "bad economic policy and morally wrong," as the AFL-CIO's official resolution states. But the battle will be as much to keep Democrats from joining in the tax cut frenzy as in combating Republicans.